Winchester's bulk-pack .22 LR 36 grain copper-plated hollow point ammo is a great value for high-volume plinking and target practice as well as for varmint and small game hunting. This product is designed to be an affordable and reliable choice for shooters who know to trust the quality and reputation of Winchester ammunition. This product is brand-new, non-corrosive, and brass-cased. 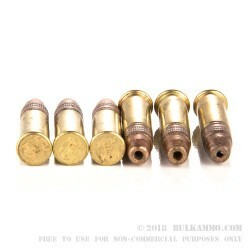 It features a copper-plated lead bullet with a hollow point, which is designed for expansion on impact with the target. It features a reliable primer and a clean-burning powder load. 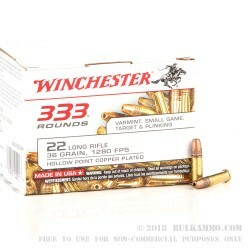 This product is 10 boxes of 333 rounds, for a total of 3330 rounds, perfect for a day on the range. I actually bought the 5550 round pack but they do not have it listed anymore. 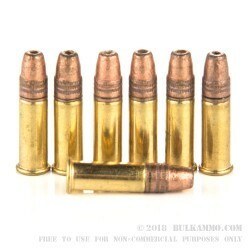 The ammo is great i have ran through about 1000 round so far and have not had one failure to fire, very impressive for rimfire. It functions flawlessly in all my .22 guns (22/45, cmmg ar15 conversion, mossburg 702, and a mossburg m44 bolt gun). On my Jennings j22(out of spec chamber) i noticed the brass would flare out and cause it to stick in the gun, this was due to the guns chamber being messed up and it does this with everything but CCI minimags. Over all very good but the brass seams a little thinner than most tho it could just be my lot.